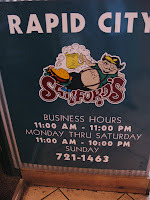 I had a great salad in Rapid City before heading home yesterday. 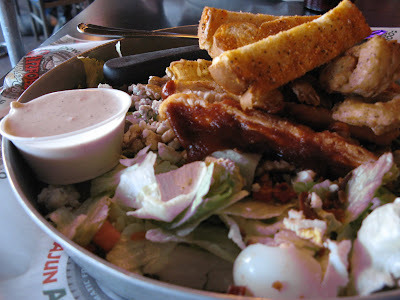 This BBQ Chicken Salad was so huge that it needed a huge fork to go with it! Strips of barbecued chicken on a bed of greens with hard boiled eggs, walnuts, blue cheese crumbles and toasted crouton strips rounded out the salad. Blue cheese dressing was an added touch. The BBQ sauce was not too spicy but sweet and good. It was a great lunch time choice but I left way too much behind on my plate! My friends made choices of the bourbon chicken wings -- not overly bourboned, they said, but a nice sweet brown glaze tickled their palates. 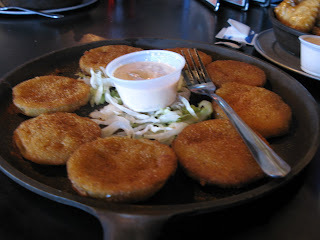 The both chose the friend green tomatoes with their wings and offered me a sample. Nice and crispy with the addition of a little Cajun spice for a kick, I believe. While you are waiting for your entres, or for your friends to finish up their generous portions from the lunch menu, you'll find lots of things to catch your eye. 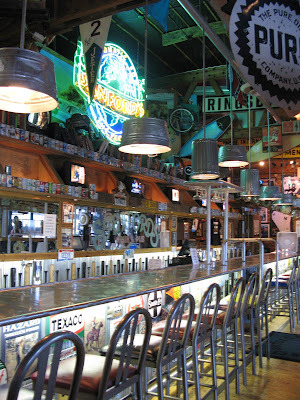 For example, a wall full of old South Dakota license plates or hubcaps. From our table we had a view looking up Marilyn Monroe's dress, or we could tickle the toes of a mannequin whose lets were hanging over the end of our table from above. Quite the colorful place, as you can see.